January 30th 1933 marked the beginning of the end of the Weimar Republic, with Adolf Hitler’s appointment as German chancellor. Hitler’s elevation to the chancellorship was hardly the glorious ascension to power he had dreamed of back in 1923. Rather than being swept into power on a wave of public support, or snatching control of the government with a bold and decisive move, Hitler instead became chancellor through a shadowy backroom deal. And there was little to suggest that Hitler’s political fate would be much different to the 14 men who preceded him as chancellor. But within two months the Nazi leader had killed off Weimar democracy and set Germany on the road to authoritarian dictatorship. Hitler decided to test his increasing support by running against Hindenburg in the presidential elections of March 1932. The Nazi leader campaigned vigorously, particularly in areas of Germany where he was not well known. He employed the slogan Hitler uber Deutschland (‘Hitler over Germany’) and hired aircraft to visit and campaign in more than two dozen major cities. Though Hindenburg won the election with 49 per cent of the vote, the campaign and resultant media attention thrust Hitler into the national spotlight. Hitler was convincing enough to win 30 per cent of the presidential vote, while his growing prominence aided the Nazis in the Reichstag elections of July 1932. In this poll the NSDAP won 230 of the 608 seats, making it by far the largest party in the Reichstag. By late 1932, many conservatives were openly lobbying Hindenburg for Hitler’s appointment to the chancellorship. They told Hindenburg that having Hitler as chancellor would hand the ministry NSDAP votes in the Reichstag – and this could be used to limit the influence of the Social Democrats (SDP), a party Hindenburg despised. The president, who had a low opinion of Hitler’s abilities and grave concerns about his fanaticism, remained cool to the idea. Like his former colleagues in the Reichswehr, Hindenburg was also worried about the rapid growth and undisciplined thuggery of Hitler’s private army, the Sturmabteilung (SA). The president brushed off the suggestion of a Hitler ministry and held out for another solution. Hitler also enjoyed support in other sectors of German society. The NSDAP leader’s public image, impressive speech-making and aggressive negotiating had earned him the backing of many wealthy industrialists and business owners. Several notable capitalists had made large political donations to the NSDAP, allowing it to continue its political activities through the worst of the Great Depression. Newspaper mogul Alfred Hugenberg not only provided financial support to Hitler, he also urged his editors to provide the Nazi leader with sympathetic media coverage. Many of these powerful men wrote to Hindenburg, urging him to consider Hitler’s appointment as chancellor. Hindenburg held them off through 1932. His last hope for a solution was the Reichstag elections of November 1932. But like all elections before, it failed to produce a majority government or even a stable coalition. Hindenburg appointed Kurt von Schleicher, a Reichswehr general, to the chancellorship, in the hope that he could form some kind of working coalition with the NSDAP. But von Schleicher’s chancellorship was brief, a short collection of failures and missed opportunities. Von Schleicher was continually undermined by Hugenberg’s pro-Nazi newspapers, which ran critical stories and editorials, calling for von Schleicher’s replacement with a stronger leader, “such as Herr Hitler”. Also encouraging Hitler’s appointment behind the scenes was Franz von Papen. A conservative who had himself been chancellor until November, when he was dumped in favour of von Schleicher, von Papen was a self-interested intriguer, who saw in Hindenburg’s uncertainty an opportunity to restore his own influence. He urged the president to consider replacing von Schleicher with Hitler. He eased Hindenburg’s concerns about Nazi fanaticism by suggesting that Hitler, for all his grand intentions and personal intensity, was a political novice; once in power, he could be kept in check and easily controlled. The old president finally relented on January 30th 1933, when he summoned Hitler to his office to receive the chancellorship. According to legend, Hindenburg was so reluctant to give Hitler the reins of government that he could scarcely look the Nazi leader in the eye. But the appointment was made nevertheless, Hitler swearing that he would “employ my strength for the welfare of the German people, protect the Constitution and laws of the German people, conscientiously discharge the duties imposed on me, and conduct my affairs of office impartially and with justice to everyone.” The new chancellor was one of only three Nazis in the 11-man cabinet – a plan cooked up by von Papen to restrict Hitler’s power. 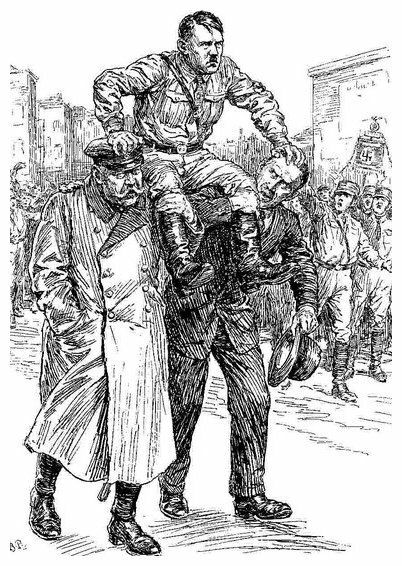 Hitler had thus ridden to power on the shoulders of Hindenburg and von Papen, a fact recognised in a British cartoon. News of Hitler’s appointment was received contemptuously by the democratic press in Germany and elsewhere in Europe. In Berlin, the International News Service reported that “Adolf Hitler, Nazi chieftain who began life as a house painter and street sweeper, achieved his life’s ambition today when he was appointed Chancellor of the Reich.” One of the men who had supported Hitler’s 1923 Munich putsch was Hindenburg’s former boss, General Paul von Ludendorff. On hearing news of Hitler’s appointment, Ludendorff telegrammed Hindenburg, telling the president “…you have handed over our Fatherland to one of the greatest demagogues of all time … Future generations will curse you in your grave for this action”. The man instrumental in Hitler’s appointment, von Papen, remained cocky about his ability to control the new chancellor. “In two months time we will have squeezed Hitler into a corner until he squeaks”, von Papen told a confidant. He could not have been more wrong. Within two months Hitler had seized almost all political power in Germany, dismembering the state, disempowering the Reichstag and consigning Weimar democracy to the wasteland of history. 1. Though his popularity had increased, especially in southern Germany, in early 1932 Hitler was still a fringe politician. 2. President Hindenburg had no great respect or admiration for Hitler, believing him to be unworthy of leadership. 3. In July 1932 the Nazis, aided by press barons, won 230 seats and became the largest party in the Reichstag. 4. Frustrated by political inaction, Hindenburg was persuaded to sack von Schleicher as chancellor and appoint Hitler as his replacement. 5. The man who agitated for Hitler’s appointment and suggested it to Hindenburg, the Centre Party’s Franz von Papen, believed Hitler could be controlled and moderated. J. Llewellyn et al, “Hitler becomes chancellor”, Alpha History, accessed [today’s date], https://alphahistory.com/nazigermany/hitler-becomes-chancellor/.